With over an inch of rain that stopped just in time for the 5AM departure for the 300k, the streams and waterfalls along the course were flush with running water. Temperatures at the start were in the mid 40F's and warmed up to the 50F's, with sun poking through the clouds all day. The powerful storm that came through during the night left its mark in the form of strong gusty winds out of the west. That certainly made the leg from Wind Gap to Little Gap harder. And after the climb of Little Gap, those winds through the S-turns on the downhill, made the descent rather treacherous -- thankfully, the Guardian Angels for everybody were able to keep up without any incidents! Of note, Flavio Pardo and Matthew Groff successfully completed their very first brevets. As freshly minted randonneurs, they just need to complete 11 more in the coming months for their R-12 award. Thanks to Hugo and Gloria Safar for introducing Flavio, and to Clair Beiler for introducing Matthew to our sport. 200k first finisher (on a fixed gear! ), Guy Harris writes: "...Thanks to you and Bill O for putting this on. This was a nicely balanced course containing many favorite roads. The re-surfaced Staats was an improvement, made walking the last little bit smoother! Too early in the year to make the whole thing on the fixed. I saw one eagle of the pair south of Portland perched in a tree next to what looked like a real nest..."
waterfalls and the glimmering Delaware entering magestic Walpack bend. Very nice road. A keeper..."
Chris also was one of a couple of riders who stopped at the recently re-opened Layton store, which now is being run by a Greek couple. He reports: "... I had a most excellent Gyro platter served acceptably quick. No tuna subs or rabbit food on the menu ... but good for a big, fragrant, artery clogging meal should that be a rider's need. The burgers seemed awesome as well. 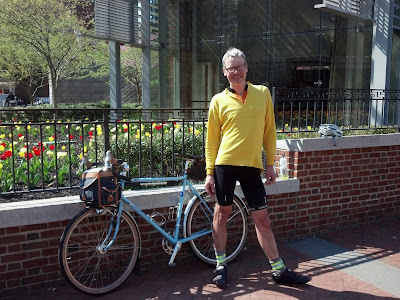 ..."
300k first finisher, Don Jagel, writes: "...Thanks to you and Bill for putting together the 300K brevet. The route was on many of the roads we have all seen before. Changing directions, and adding a few new segments really made it seem like a new course, yet still familiar. The weather was just about perfect for a spring ride. The cold front that blew through over night before the start of the ride really cleared the air, and the rain made sure there were plenty of cascading water falls to add to the scenery. Of significant note; the rough, but much improved, and patched, descent of Old Mine Road allowed me to actually descend at a speed of more than about 10 MPH. That has got to be a first in many years. Hopefully they will actually re-surface that section and make both the climbing and descending a little less epic....."
Christine Newman writes: "...Thanks for organizing the ride and developing the new route. 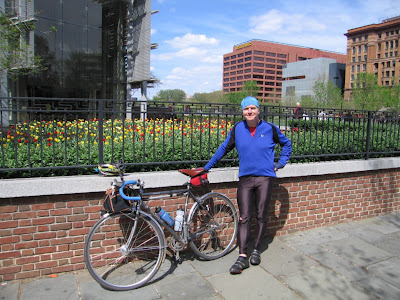 I thoroughly enjoyed it and the new route through Peter's Valley was quite nice and very quiet with almost no cars while we were there ..."
Len Zawodniak, riding on his newly painted recumbent, writes: "...thanks for the great day on the bike. I used every gear I had, including the elusive 24 inch gear and really enjoyed the challenge ..."
".. Gavin, Jon and I set out to Crushed the Commonwealth, starting 5:00 Friday morning. 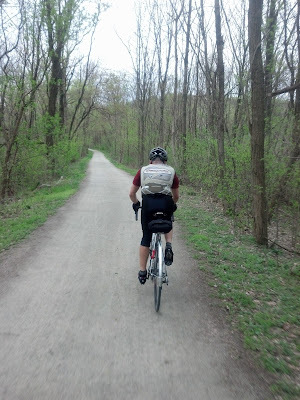 We traveled to Pittsburg with the plan to show them what Eastern PA Randonneurs is all about. When we hit the Gap trail on the Pittsburg end, I got a flat that slowed Jon and I down from the pack. After fixing the flat Jon and I were making good time on the clay & cinder trail. Somewhere before Connellsville Jon dropped off, and then it started to rain. That hard pack clay trail turned into a sponge, making our way to Rockwood very difficult. After leaving the trail, the real rain started to fall between Somerset and Bedford. Luckily I was packing a dependable rain jacket. When I got to Bedford, I spotted a Burger King that I could get out of the rain and get some real road food. A whopper never tasted so good. Leaving Bedford with Breezewood only 20 miles down the road, and the rain slowed down to a drizzle and a strong tail wind made that 20 miles go by fast. In Breezewood, I caught up to Gavin with Jon bring up the rear. Leaving Breezewood, we set out to take the easy way using the abandoned PA turnpike instead of going over the mountain. Now in a party of 5, we hit the first tunnel of the old PA turnpike at dusk and when we left tunnel number 2, it was dark. I had difficulty keeping up with the rest of the group stopping to fix the handle bar bag, I lost them. Getting to the end of the road, I couldn't find my way off the old road. Consulting the maps on my phone was no help. I did see that I got a call from Jon saying that he was going to stay the night in Breezewood with a fellow Philly guy (Bob). I gave him a call and chatted, but there was no way I was going back over the old Turnpike to Breezewood to spend the night. Eventually, I did find the access road off the old highway and made my way to Chambersburg arriving there around midnight. In the true Rando spirit I used the Sheetz as my rest spot getting some sleep on the sidewalk outside. Waking up about 2:00, it took me nearly an hour to thaw out, drinking hot water then coffees to caffeinate my system. When I was leaving, another rider Sarah was just coming in, we made small talk as she fixed her flat tire. Off I go with 150 miles to go, open roads and dry weather. Making York by 6:50, crossing the Susquehanna River at 7:50 then Lancaster 9:00, I knew I was getting close. I have been riding alone without the whereabouts of my fellows Gavin or Jon. Arriving in Morgantown on familiar territory home was near. Checking the phone I found out that Jon had a major mechanical before arriving to Breezewood and had to drop out of the ride. In the Morgantown Sheetz, a lady asked me how far I rode today; she lost it when I told her that I started in Pittsburgh Friday morning. I arrived at the Liberty Bell before 3:00 pm Saturday, completing the ride in less than 34 hours, 380 +/- miles. Checking my phone, I realized that Gavin was behind me the whole way since Chambersburg and finish right behind me. What an epic ride. ..."
"... I was just getting my second wind after talking to Norm on the phone from The Burger King just before Breezewood. Anyway going up a little growler hill before Breezewood and planning on at that point riding through as I was now warm and dry I heard a small clicking from the rear wheel. I stopped but could not see anything in the spokes or anything else that would indicate something catching in the wheel. Anyway I proceeded on and no sooner had I remounted and gone 10 yards that my whole drive train jammed up. I got off and looked and basically saw the "Perfect Storm" of Rando angst. Seen as though I was riding with Bob from the Philly bike shop Trophy Bikes he immediately diagnosed what had happened. So, on the GAP trail my chain had become dry with the gravel and rain blasting away the lube. At some point on the climb one of the side plates on the chain link had lifted away from the pin and was causing the clicking sound as it travelled through the derailleur cage and was why at 10pm at the side of the road with just a headlight and some fatigue I could not see the problem as it was almost invisible even to a trained eye. So what happened next was maybe predictable. The chain got caught in the derailleur cage as I was putting a lot of stress into the cranks on the climb. I pulled the derailleur from facing down vertically to horizontal facing the rear. This in turn pulled the derailleur hanger horizontal and into the cassette, the whole wheel jammed up, broke the chain in three places, cut the derailleur cage into two pieces and knocked the wheel out of alignment. Talk about a mechanical at night in the middle of nowhere. Anyway, I managed to get the wheel out and true it up and cut the derailleur away. I had just enough chain left that Bob and I could piece it together to try and make a single speed, but without a tensioner. We pounded the derailleur hanger away from the cassette with a roadside hammer, otherwise known as a large stone. Once this was done (1 hour fix for two riders) we set off and I was quite confident that we may have got lucky as the bike seemed to be riding OK. The problem now was that the chain line was slightly off as we had to choose a cog for the length of the chain I had and we had nothing for tension or keeping a good chain line. So what happened was the chain kept jumping up to the next larger cog. This was severely stretching the chain, so much so that after several manual down changes by dropping out the wheel to shift the chain back onto the correct cog the chain finally gave out and essentially disintegrated. 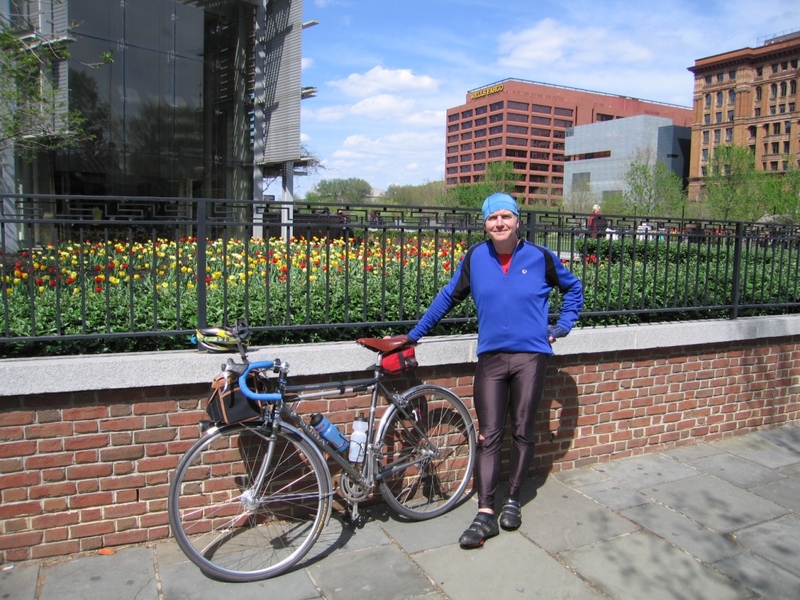 This was now five miles from Breezewood, Bob rode on so that he would not be too late to check in at the hotel. So now I was down to straddling the bike and doing leg pushes and coasting where possible. To compound it all I had a rear flat two miles from the hotel. Finally at 1am I joined Bob at the hotel for a rest and a re-think on what could be done. Luckily Bob had a smart phone and we quickly found that there were no bike shops around for a potential interim fix that would let me finish . So I had my first abandonment in my Rando career. Should have put a new chain on, the one I was riding was about 2 years old. Anyway my titanium frame will have to be sent away to have a new drive side dropout put in and a realignment. Anybody know who may do this locally (frame is a Litespeed). Norm I can do the 300k pre-ride on a fixed or single but no gears!!" ".,,My second and last Crush the Commonwealth (please remind me of this next year!) – 385 miles from Point State Park in Pittsburgh to the Liberty Bell in Philly. Finished this year’s CTC in 34:15 hours with bike racer Kris. One hour slower than last year due to torrential rains in Bedford Friday afternoon leading to hotel stay for shower and 4 hour sleep in Chambersburg. I believe 20 or so finished (some late Sunday) of about 30 who started. It is an unsanctioned race so no formal list of starters exists. Finished in 4th place, 5 hours behind winner Tom Oswald, a bike frame builder from Mansfield, PA. Below is a photo of Oswald on the Great Allegheny Passage (GAP) trail at about mile 60. ... Kris and I caught up with Steph at East Berlin 20 miles west of York at about 7 am. She finished 2.5 hours after us on Saturday afternoon for the fastest woman finish ever – 36:42 hours"
Preliminary results show Norm finishing 3rd and Gavin tied for 4th -- well done! The cuesheet for the Blue Mountain 300k has been updated to draft 2, dated 4/16/13 with minor clarifications from the a volunteer preride completed by Bill Olsen, this past weekend. Hopefully, the heavy rain in the forecast for Friday night into early Saturday morning will clear out quickly. But it looks like there's a good chance for a "character building" opportunity ... at least for the 300k riders, with their 5AM start. The bakery opens at 6AM, so the riders clipping in for the 200k will be able to top off with coffee and breakfast before their 7AM start. Please note that you need to decide on riding the 200k or 300k course at the start -- i.e. : you can't change your mind in Water Gap, where the 200k and 300k split. For those opting for the 200k, you should note that there is another chance to ride a PA300k on May 4th. Organizer Bill Olsen will be meeting you at the start and sending you off on your way. Please note that the bakery will be closed at 5AM -- Bill will meet you in the bakery parking lot near the RR tracks. You should park your car in the big lot off of Church St, which US Health has granted us permission to use. I will meet you at the finish at Pipolo's Pizza -- if you arrive before I do, leave your brevet card and any loaned SPOT devices at the checkout counter. - As noted on the cuesheet, there are a couple of RR crossings early on. The one at mile 7.2 is particularly hazardous, with a bad angle, and will be extra treacherous if wet. Please take extra caution here, especially if you are in a large group. - The 300k riders will be headed into the Delaware Water Gap Recreation Area. The descent from Millbrook Village is still very rough, as noted on the cuesheet at mile 96, although some of the bigger craters have at least been patched up a bit. (In talking with the park administrators, there are plans to resurface this rotten stretch of road some time this year.) Also please note, that the cuesheet has you turning LEFT at the bottom of that descent, instead of RIGHT, giving you the opportunity to see some new roads. - Since we haven’t ridden these routes since last year riders will be pleased to note that some of the other sections of the road have been repaired since last summer including the climb up Blue Mountain Drive, mile 51.7, where the potholes along the right side of the roadway and missing shoulder were replaced all the way up to the top, crossing the Appalachian Trail. Riders should exercise caution on the descent as there are areas that were patched and “chipped and sealed” resulting in some uneven surfaces. -Old Mine Road, mile 115.4, is still in rough shape but the bulk of the damage is on the other side of the road and if one pays attention they should find a good line along the right hand side of the roadway. The deepest potholes are at the end of the section where the road is less broken up. ... and selecting the tab for Norman. The PA 1-5 SPOT trackers will be tracking selected riders for Saturday's event. (and special thanks to Don Jagel, for maintaining the SPOT Tracker webpage! ).